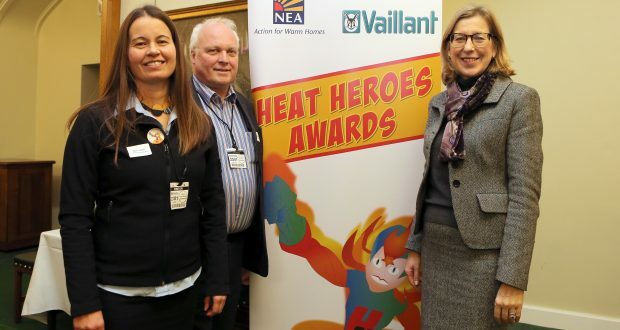 A Case Worker from the Cornish energy advice charity Community Energy Plus was named a Heat Hero at a special awards ceremony at the Houses of Parliament. Karen Leach from St Columb has almost ten years’ experience of providing phone-based energy advice for Community Energy Plus and in the last three years her role has broadened significantly, helping to shape and deliver in-home advice, handholding and advocacy services within the charity. Karen uses her energy, drive and technical knowledge to help vulnerable households in Cornwall escape from the misery, anxiety and ill-health caused by fuel poverty. She frequently helps clients to apply for energy trust fund grants to alleviate fuel debt and also puts together funding jigsaws from multiple benevolent funds when no assistance is available.